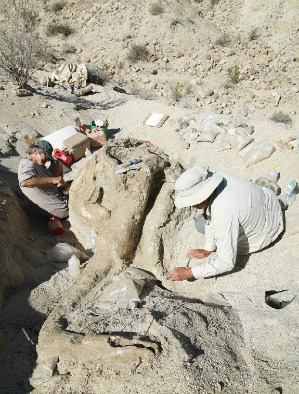 The Anza-Borrego Desert Paleontology Society, as an entity under the direction of the Colorado Desert District (CDD), Anza-Borrego Desert State Park (ABDSP), is an organization where volunteer researchers develop the knowledge and skills needed to build, support and maintain an internationally significant paleontology program. It ensures that members can participate actively and responsibly in discovering, protecting, preserving and interpreting the fossil resources from the ancient past in this unique environment. Thanks to member Myrl Beck for authoring this overview of the Society! 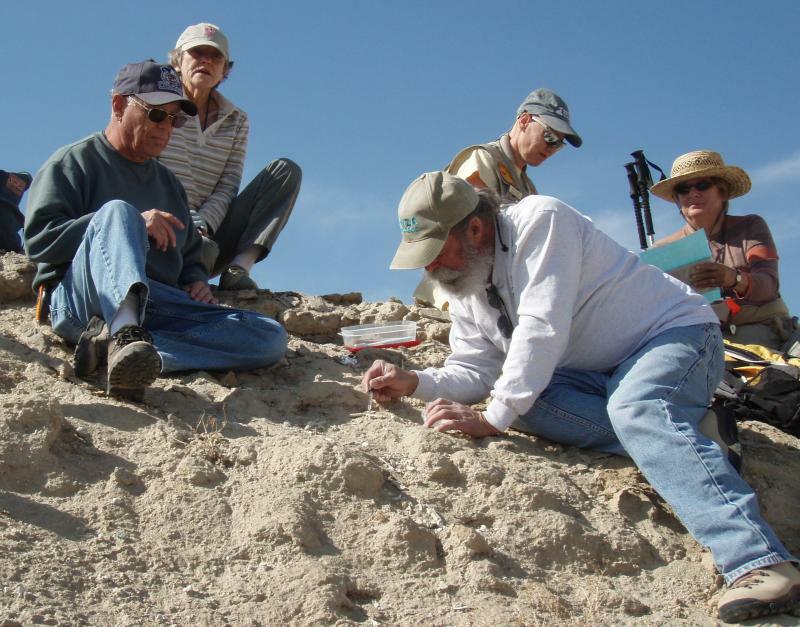 We are a diverse collection of enthusiastic amateurs who assist in the preservation, protection and scientific study of the unique fossil assemblage found in the rocks of the Anza Borrego Desert State Park (hereafter, the Park). Most of us are "mature adults", but we range in age from the early 30s to the late 80s. Many of us are retired, but many are not. At least half of us are women. Our roster contains nearly equal numbers of year-round Borrego Springs residents and seasonal visitors (snow birds). We have widely different backgrounds, but we share at least one important characteristic: none of us (except, of course, our leader) has had the least bit of formal training in what we do. This is not to deny that there are members of the Paleontology Society (hereafter, PS) who are expert in the study and analysis of fossils: on-the-job training and diligent reading can work wonders. But you don't have to know anything about paleontology, or any other science, for that matter, to become a productive and valued member. To put it succinctly, we do most of the grunt work necessary to keep a world-class research program rolling. Examples: More or less monthly we go as a great caravan into some (often) remote and little-visited corner of the Park, to look for fossils. We do this under the leadership of the program's State staff, assuring that we neither get lost nor return with the results of a recent steak-and-ribs cookout! Field work usually involves a moderate amount of hiking: the young, fit and ambitious scramble around on the summits of the hills, while the rest of us stroll sedately up some gentle wash. Any fossils found are "located" (using GPS equipment), described, and - sometimes - collected. 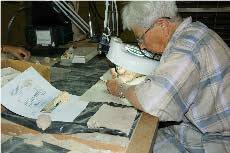 On return to the laboratory we - at our leisure - clean the fossils, treat them with preservatives, glue then back together if broken, and try to identify them (once again with the help of the professional staff). Once cleaned, preserved and identified they are cataloged ("curated") - that is, they are placed in drawers for futures researchers to study. (That future researcher may well be one of us: one of our senior members, a veterinarian in his earlier days, is a recognized and published expert on mammoths.) Some of the fossils we find are so large that they require machinery to collect (A few years ago a mammoth skull was collected by helicopter). This is the kind of fossil you dream of discovering. Others are so small that they are barely visible. Most make the trip to he laboratory in a backpack. Well, mainly because it's fun. We get to explore remote places, safely, and with a set of congenial companions, and we do it in the name of science, which makes us feel virtuous - and we may even hoist a beverage or two on our return to celebrate our accomplishments. We regularly laugh, joke and banter around the laboratory tables as we carefully pick dirt off bones. 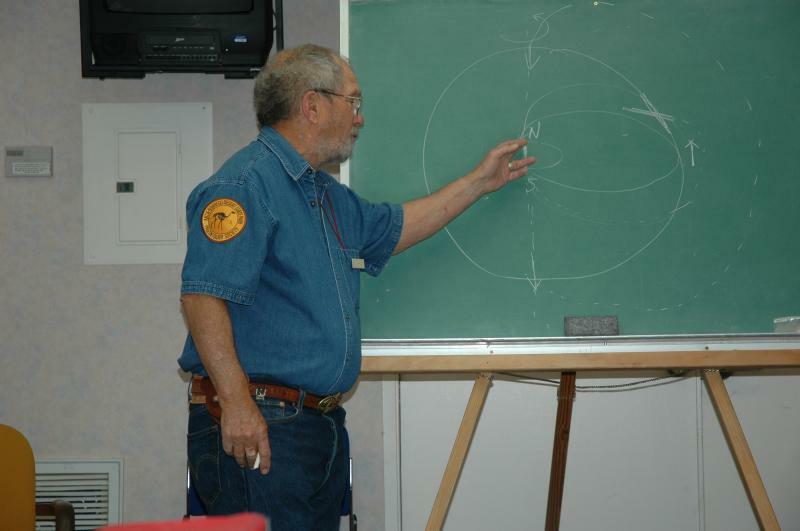 By being members of the PS we have the opportunity to learn interesting things; we have "enrichment" lectures on everything from the geology of the Park to the structure of the universe. We have parties. We have picnics. And at the end of the season the Park makes us feel appreciated, with a free dinner and a small gift. So we work hard and don't get paid - who needs it, anyway? Maybe you would like to join the PS. You would be welcome. To become a full member you must survive a course of instruction in geology, paleontology, and other equally interesting things. The course will expand your knowledge and intellectual horizons, but you don't need to worry - no pop exams, very little homework, and everybody who really and truly tries, passes. Don't worry about your age (you are almost certainly younger than the author), or your educational background. Just attend the first meeting of the season (the second Friday in November) and see what you think. There will be free cookies, probably.